Get your audio applications talking to each other with Reaper's ReaRoute. Gather your pieces of analogue effects gear together and put them in a pile. Now take any two of those pieces and try to connect them. Chances are they'll both share a common, standard connector that lets you send audio from one unit to another and back again, with the minimum of fuss. Now gather your DAW programs together in a virtual pile. Take any two of those DAWs and try to connect them without routing audio outside your computer. Chances are you won't find an easy way to route audio to and from both applications. Most of them will support the ReWire protocol, which lets you send audio from one host to another, but only in one direction. While there are workarounds for bi‑directional audio that involve third‑party patching programs, getting audio to and from two DAWs on the same computer has always been a complicated process — unless you use ReaRoute. In this article, we'll show you how to do just that, as well as how to dub between programs, and demonstrate a way to gain access to effects processors in other applications, to add something extra to your audio tracks. ReaRoute provides 16 audio inputs and outputs via a custom ASIO driver. The connections can be used as 16 mono ins/outs, as eight stereo pairs, or as any combination of the two, and provide real‑time, bi-directional audio streams between any applications that are capable of using an ASIO driver. ReaRoute is not a replacement for ReWire, however. Unlike ReWire, it doesn't support MIDI. ReaRoute supports 32-bit and 64-bit bit applications, and can also route audio between the two. Install the 32‑bit version of Reaper if you only need support for 32-bit applications. If you're running a 64-bit operating system, install the 64-bit version of Reaper to ReaRoute audio to other 64-bit applications, or the 32- and 64-bit versions to ReaRoute between 32- and 64-bit applications on the same machine. ReaRoute may not have been installed as part of your Reaper installation. 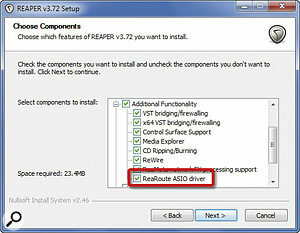 In order to use it, you must select the ReaRoute ASIO driver in the Additional Functionality section of the Reaper installer. This option adds the ReaRoute ASIO driver to your system, and it then appears as a driver option in all your ASIO‑enabled audio applications. 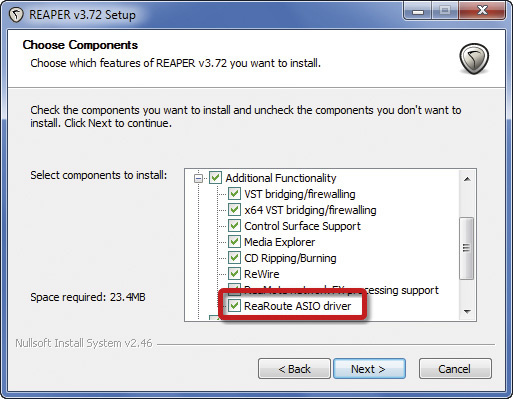 ReaRoute may not have been installed as part of the initial Reaper installation, so re‑run the installer and select 'ReaRoute ASIO driver' in the Additional Functionality section to acquire it. If you've already installed Reaper but not ReaRoute, you can run the installer again to acquire the driver. You don't have to uninstall Reaper first to gain access to ReaRoute. Reaper must be running, and must be the master application at all times when using ReaRoute. By default, however, Reaper releases the audio driver whenever it is not the focused application. To make sure this doesn't happen when you're using ReaRoute, clear the check-box for the 'Close audio device when stopped and application is inactive' option in the Audio Preferences. This ensures that Reaper maintains control of the audio driver at all times. If you don't clear that option, the driver stops working when you try to select ReaRoute in other applications. Open up a new Reaper project and create eight tracks. Open the Routing Matrix (Alt‑R) and make sure that the 'Show ReaRoute as sources' option is selected in the right‑click menu. 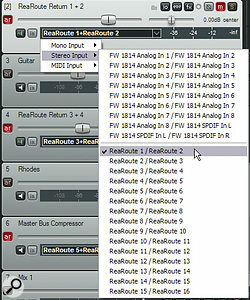 The Routing Matrix provides a quick method of assigning the inputs and arming all of the tracks. The sources are listed from top to bottom down the left‑hand side of the matrix, while the destinations are listed from left to right across the top. 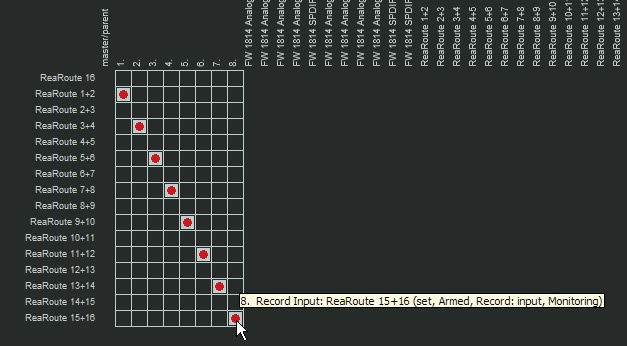 Assigning inputs and arming the tracks can be done in the Routing Matrix. Double‑click on the matrix square of the ReaRoute 1+2 input for the first track. This selects ReaRoute 1+2 as the input and record‑arms the track. 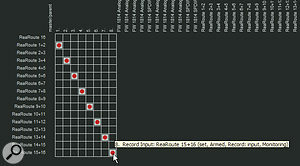 Repeat this for each of the ReaRoute and track pairs in sequence until all of the inputs are assigned to the Reaper tracks, as shown in the screenshot to the left. It's important to note that the ReaRouted application inherits the same sample rate as Reaper, so make sure Reaper's sample rate matches the sample rate of the source tracks before ReaRouting FL Studio. Open FL Studio and select Options / Audio Settings. Select ReaRoute ASIO as the audio device. FL Studio automatically detects the available inputs and outputs. Open the FL Studio mixer. Make sure each FL Studio track or instrument you want to dub has its own mixer channel. Select the first mixer channel and set the output to 'ReaRoute Client => REAPER 1 – ReRoute Client => REAPER 2'. By default, the Master output in the FL Studio mixer gets routed to ReaRoute 1+2. If you leave this selected you'll get the master mix on the first ReaRoute pair, which means you can't use it to dub an individual track. Clear this by setting the master output in the FL Studio mixer to None. When transferring your eight tracks of audio from Reaper to FL Studio, you'll need to select the output shown in the screenshot above. Press play in FL Studio and you'll hear the first FL Studio track via the first audio track in Reaper. Repeat this process for the other tracks you want to dub, then start Reaper recording. Press play in FL Studio and your FL Studio tracks are dubbed directly into your Reaper project. When you've finished the audio transfer, save the Reaper project and change the audio device in FL Studio back to the standard ASIO driver, before closing FL Studio. One of my favourite effects processors is the Scream 4 Sound Destruction Unit in Reason. For years, I'd wanted to use it as an effects processor in my Reaper tracks but, even with the creation of ReaRoute, I was never able to pass audio into Reason. With the release of Record, this wish finally became a reality. Using the Record/Reason combo provides a method of getting audio into Reason, and therefore opens up Reason to ReaRoute. 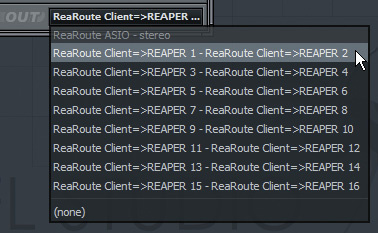 In the following example, we'll use ReaRoute to put some 'Scream' into our Reaper tracks. Open a Reaper project and click the IO button on the track you want to send to Scream. ReaRoute outputs are listed as Audio Hardware Outputs, even though they're going from one software application to another. Select a ReaRoute output from the 'Add new hardware output' drop‑down list, and set the appropriate level. Now launch Record and select the ReaRoute ASIO driver in the Audio Preferences. Click the Channels button and select the Active Input Channels. Repeat for the Active Output Channels. The ReaRoute driver acts as a virtual patchbay from Reaper to and from the selected ASIO application, in this case Record. Create an audio track and insert an instance of Scream, then select the ReaRoute channels you sent from Reaper as the input in the audio track device. Record‑enable the audio track, enable the monitoring for the audio track, then press play in Reaper and you'll see the audio from Reaper appearing in the audio track meters. 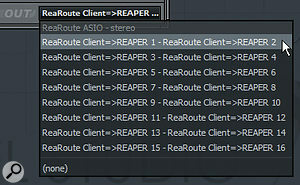 To get audio back to Reaper, we now need to route the output of the audio track to ReaRoute. Press Tab to view the back of the Reason rack. Right‑click on the Direct Out from the audio track and select the ReaRoute output you want to use to return the audio to Reaper. The final step in the routing is to go back to Reaper and create a new track for the ReaRoute returns. To use an effect in Reaper that comes from another program, set up a track that routes audio back into Reaper. 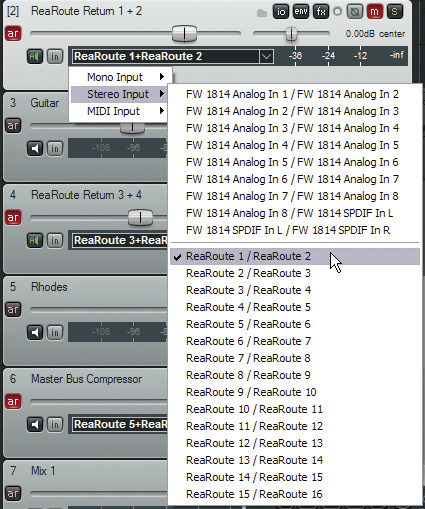 Record‑enable the new track, and then select the ReaRoute channels you set in Record as the input for this track. Press play in Reaper and you'll hear the returned sound, processed by the Scream unit in Record/Reason. The same process can be used to access any of the effects processors in Record/Reason, including the Master Bus Compressor. ReaRoute works with any ASIO‑compatible programs, not just DAWs. However, while it's technically possible to use ReaRoute to route audio to and from more than two applications at a time, the driver drops out on my machine when I route audio to and from FL Studio and Record/Reason at the same time. Your mileage may vary, depending on the capabilities of your system, but it's worth remembering that ReaRoute works best when you limit it to two applications. When you've finished using ReaRoute, it's a good idea to set the audio device in your non‑Reaper applications back to their default settings, as you may experience some unexpected behaviour if you open a ReaRouted program without opening Reaper. ReaRoute is not meant as a replacement for your normal ASIO driver, but works perfectly as a virtual patchbay for real‑time audio streaming, so you can quickly get audio where you need it to go.